suggestions for a future research agenda for those interested in ameliorating the destructive side of organizational communication. 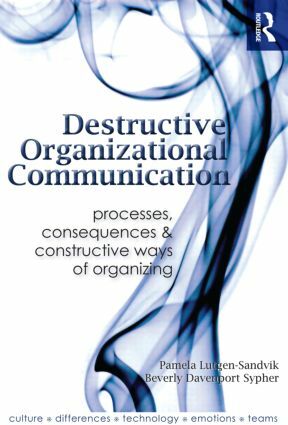 Overall, the collection provides a basic understanding of the different types of destructive communication in organizations, the processes through which these interactions occur, the consequences to individuals and organizations, and the potential for organizing in more constructive, civil ways. This volume will be an excellent resource for scholars and researcher studying organizational communication, and graduate and advanced undergraduate students in organizational communication. It will also resonate with managers dealing with hostile workplaces, and organizational members trying to understand their current experiences. The book will serve as an excellent textbook for advanced undergraduate and graduate courses in organizational communication. Working Alone: What Ever Happened to the Idea of Organizations as Communities?